Nectaroscordum (Sicilian Honey Garlic) is a small genus (only two species are known) that looks a lot like Allium. 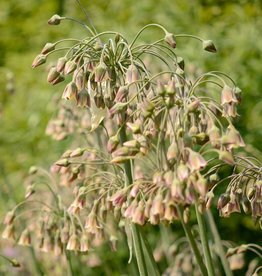 The name ‘Nectaroscordum’ is made up of two parts: ‘nectar’, a sweet honey-drink from the Ancient Greek period, and ‘scordium’, referring to the oniony smell that this bulb spreads. Nectaroscrodum produces a lot of nectar indeed which attracts many a bee and bumblebee.